I THE DIVINE PURPOSE OF MARY'S COMPASSION. Please note that emphasis in bold was added by the Web Master. AT first we stood on the shore of Mary's sorrows and gazed upon them as one vast ocean. We then sounded, one after another, the seven abysses of that ocean, which the Church selected and presented to us. Now we look at her dolors again as one, but pouring their waters through the strait of Calvary into the mightier ocean of the Precious Blood. This peculiar point of view is called the Compassion of Mary, the right understanding of which involves several grave theological questions, and yet is most necessary to make our devotion to the dolors real and profound. There are, in fact, seven questions for us to consider: the Divine purpose of her Compassion, its nature and characteristics, what it actually effected, the relation in which it stands to our own compassion with her, a comparison of the Passion with Mary's Compassion, the seeming excess of the Compassion over the Passion, and, lastly, the measures and dimensions of her Compassion. First of all, then, we have to consider the Divine purpose of her Compassion. It is very questionable whether we might ever say of anything in God's works that it was "merely ornamental." There is something in the idea of mere ornament which seems at variance with the actuality of God, with the magnificence of His simplicity, with His adorable reality. To suppose our Lady's dolors to be so much ornamental pathos added to the Incarnation even for the holy end of exciting some additional degrees of love, would involve still further questions regarding the character and perfections of God, His tenderness toward His creatures, and the merciful significance which there is in every pain and sorrow through all creation. It is not easy to see how he who should hold such a view of our Blessed Lady's sorrows could be excused from the highest irreverence, or even from implicit blasphemy. God certainly had a purpose in them. He has a purpose in everything which He ordains. But His purpose in so very marked a feature of the Incarnation as the unutterably woeful destiny of the Mother of God must have been proportioned to the magnitude of the mystery itself, and of that larger mystery of which it is a part. It could not have been a simple pathos. God could not have martyred one of His creatures only to throw a poetical halo round the intense realities of Calvary. Neither could it have been merely a lesson to us. For much of her Compassion is not only inimitable by us, and so beyond our reach, but also incomprehensible to us, and so beyond our understanding. It is true we learn lessons from it, because there is teaching in all that God does. But this is a different thing from God's having no further intention in a mystery than that it should be a lesson to us. Neither can it have been only for her sanctification, though no doubt this was one great purpose in it. She had become the Mother of God before her dolors commenced; and they were a consequence of her Divine maternity, not a preparation for it. They did sanctify her. Indeed, they were in an especial sense the sanctification of one who, being sinless, could not be sanctified, as the Saints have been, by struggle, evil propensity, or inward temptation. But it is hard to contemplate them at all studiously and believe that their purpose ended here. We crave a deeper and diviner purpose, and one more closely knit to the whole scheme of the Incarnation; and we may be sure that such a one exists, even though it may be beyond our discovery. 1. Our Blessed Lord is the sole Redeemer of the world in the true and proper sense of the word, and in this sense no creature whatsoever shares the honor with Him, neither can it be said of Him without impiety that He is co-redeemer with Mary. 2. In a secondary dependent sense, and by participation, all the elect co-operate with our Lord in the redemption of the world. 3. In the same sense, but in a degree to which no others approach, our Blessed Lady co-operated with Him in the redemption of the world. 4. Besides this, and independent of her dolors, she co-operated in it in a sense, and after a manner, in which no other creatures did or could. 5. Furthermore, by her dolors, she co-operated in the redemption of the world in a separate and peculiar way, separate and peculiar not only as regards the co-operation of the elect, but also as regards her own other co-operation, independently of the dolors. These five propositions seem to place the whole question in a tolerably clear light. It does not appear to be necessary to say any thing about the first. It is of faith that our Blessed Lord alone redeemed the world. The elect co-operate with Him in this work as His members. They have become His members by redeeming grace, that is, by the application to their souls of His sole redemption. By His merits they have acquired the ability of meriting. Their works can satisfy for sin, the sins of others as well as their own, by their union with His. Thus, to use St. Paul's language, by their sanctified sufferings or by their voluntary penances they "fill up in their bodies that which is lacking of the sufferings of Christ, for His Body's sake, which is the Church." Thus by the Communion of the Saints in their Head, Jesus Christ, the work of redemption is perpetually going on by the accomplishment and application of the redemption effected on the Cross by our Blessed Lord. It is not a figurative and symbolical, but a real and substantial, co-operation of the elect with our Blessed Redeemer. There is a true secondary sense in which the elect merit the salvation of the souls of others, and in which they expiate sin and avert its judgments. But it is by permission, by Divine adoption, by participation, and in subordination to the one sole and complete redemption of Jesus Christ. But the holiness of all the Saints together does not even approximate to the holiness of Mary. Her merits have a sort of infinity as compared with theirs. Their martyrdoms and dolors are little more than shadows when placed by the side of hers. Thus in their own sense of co-operation she exceeds them in degree immeasurably, so that her co-operation with our Lord almost throws theirs into the shade. On this account she might be called co-redemptress with a truth, which would be far less applicable to the Saints. But this is not all. She co-operated with our Lord in the redemption of the world in quite a different sense, a sense which can never be more than figuratively true of the Saints. Her free consent was necessary to the Incarnation, as necessary as free will is to merit according to the counsels of God. She gave Him the pure blood, out of which the Holy Ghost fashioned His Flesh and bone and Blood. She bore Him in her womb for nine months, feeding Him with her own substance. Of her was He born, and to her He owed all those maternal offices which, according to common laws, were necessary for the preservation of His inestimable life. She exercised over Him the plenitude of parental jurisdiction. She consented to His Passion; and if she could not in reality have withheld her consent, because it was already involved in her original consent to the Incarnation, nevertheless she did not in fact withhold it, and so He went to Calvary as her free-will offering to the Father. Now, this is co-operation in a different sense from the former, and if we compare it with the co-operation of the Saints, their own co-operation, in which Mary herself alone surpassed them all, we shall see that this other peculiar co-operation of hers was indispensable to the redemption of the world as effected on the Cross. Souls could be saved without the co-operation of the Saints. The soul of the penitent thief was saved with no other co-operation than that of Mary, and, if our Blessed Lord had so willed it, could have been saved without even that. But the co-operation of the Divine Maternity was indispensable. Without it our Lord would not have been born when and as He was; He would not have had that Body to suffer in; the whole series of the Divine purposes would have been turned aside, and either frustrated, or diverted into another channel. It was through the free will and blissful consent of Mary that they flowed as God would have them flow. Bethlehem, and Nazareth, and Calvary, came out of her consent, a consent which God did in no wise constrain. But not only is the co-operation of the Saints not indispensable of itself, but no one Saint by himself is indispensable to that co-operation. Another Apostle might have fallen, half the Martyrs might have sacrificed to idols, the Saints in each century might have been a third fewer in number than they were, and yet the co-operation of the Saints would not have been destroyed, though its magnificence would have been impaired. Its existence depends on the body, not on the separate individuals. No one Saint who can be named, unless perhaps it were in some sense St. Peter, was necessary to the work, so necessary that without him the work could not have been accomplished. But in this co-operation of Mary she herself was indispensable. It depended upon her individually. Without her the work could not have been accomplished. Lastly, it was a co-operation of a totally different kind from that of the Saints. Theirs was but the continuation and application of a sufficient redemption already accomplished, while hers was a condition requisite to the accomplishment of that redemption. One was a mere consequence of an event which the other actually secured, and which only became an event by means of it. Hence it was more real, more present, more intimate, more personal, and with somewhat of the nature of a cause in it, which cannot in any way be predicated of the co-operation of the Saints. And all this is true of the co-operation of Mary, without any reference to the dolors at all. But her dolors were of themselves another co-operation still more peculiar. The Incarnation might have taken place without its sorrowful mysteries. Indeed, if there had been no sin, it would have taken place in glorious and impassible Flesh, and of the same Mother with a different destiny, a destiny of joy as marvelous and inexplicable as was in fact her destiny of sorrow. The joys of Mary are like flashes from some other set of Divine decrees, which was not wholly overlaid by the present dispensation. This is their peculiarity. They are tokens of a mystery existing in the mind of God, but which to us is no more than a possible world, or rather a world which our sin would not allow to realize itself. Thus it is impossible to separate the dolors of Mary from her Divine Maternity. They follow from it in the way of consequence as necessarily as in the free Divine counsels the Incarnation of shame and suffering followed from the necessity of expiating sin. Her sorrows were caused by and inextricably commingled with His sorrows. They came from the same source; they led into the same depths; they were connected with the same circumstances. The two sorrows were but one sorrow afflicting two hearts. Besides this, as we shall see afterward, there were many peculiar points not only of striking resemblance, but of actual union, between her dolors and His. Yet, though we cannot separate her dolors from her Maternity in fact, her Maternity is quite conceivable without her dolors, and its peculiar co-operation with our Lord in the redemption of the world depends on other things than the dolors, things to which the dolors are by no means indispensable. So in like manner, or rather as a consequence, the co-operation of her dolors was a distinct co-operation from that of her Maternity, and has a character of its own. Thus, Mary has three distinct rights to the title of co-redemptress. She has a right to it, first of all, because of her co-operation with our Lord in the same sense as the Saints, but in a singular and superlative degree. She has a second right to it, which is peculiar to herself, because of the indispensable co-operation of her Maternity. She has a third right to it, because of her dolors, for reasons we shall see presently. These last two rights are unshared by any other creature, or by all creatures collectively. They belong to the incomparable magnificence of the Mother of God. It has been our privilege, more than once during the course of this inquiry into our Lady's dolors, to ascend some fresh height from which a new view of her grandeur has presented itself to us. Like the great summits in the mountain-ranges of Alps, Andes, or Himalaya, each new aspect of Mary's glory looks grander than the others. In truth, it is with her greatness as with the greatness of sublime mountain-scenery: we cannot carry its magnitude away with us in our minds. We see it, and appreciate it, while we are actually gazing on it: but when we turn away, the image of it in our minds is less than the reality. So, when we see the mountain again, from whichever side we get the view, it looks larger than it did before, because it is larger than our remembrance of it. So is it with our Blessed Lady. The moment we cease to rest our eye upon her in deep meditation, our idea of her is less than it ought to be. We never do her justice except when we gaze upon her. Perhaps it is so with all God's greatest works, as we know it is with God Himself. Hence it is that we so often hear objections to statements about the glory of Mary, coming even from pious believers. Their eye is not on her, and therefore what is said is incredible to them. Nay, they are the more convinced that the statements are exaggerated, because they so far transcend the image of Mary which is impressed upon their minds. They believe more of her, and they believe it more readily, as her feasts come round, for then their eye is on her, and they conceive more justly of her vastness. In nothing is she more like God than in having to be thus learned in order to be understood, and in having to be kept before us in vision, because our memory is not wide enough to hold her vast proportions when she is out of sight. This co-operation of our Blessed Lady, is, therefore, another summit from which we gain a fresh view of her magnificence. It it the grandest privilege of the creature to be a fellow-laborer with the Creator, just as it will be our home and blessedness to enjoy His everlasting sabbath. But what is to be said of co-operating with Him in such a work as the redemption of the world, and co-operating in it with such efficacy, intimacy, and reality, nay, with a co-operation simply indispensable to its accomplishment? What an idea does it convey to us of immeasurable holiness! What gifts and graces does it not presuppose! What marvelous union with God does it not imply! It is as if He vouchsafed to select the very things about Him which are most incommunicable, and, in a most mysteriously real way communicate them to her. It is as if, in those things in which He stands alone and solitary, He drew her so nearly to Himself, that to us it should seem as if He was not solitary, because she was with Him. See how He had already mixed her up with the eternal designs of creation making her almost a partial cause and partial model of it. Yet this, while it accounts also for her share in the redemption, does not make her co-operation less wonderful. Divine works grow more wonderful in our eyes as we discern more of their consistency and unity. No wonder then the Saints should have sought to invent a word, a bold and startling word, which should express such an indescribable grandeur in a creature as is involved in this threefold co-operation of Mary in the redemption of the world. Our Lord had taken a created nature, in order that by its means He might accomplish that great work; so it seemed as if the highest honor and the closest union of a sinless creature with Himself should be expressed in the title of co-redemptress. In fact, there is no other single word in which the truth could be expressed; and, far off from His sole and sufficient redemption as Mary's co-operation lies, her co-operation stands alone and aloof from all the co-operation of the elect of God. This, like some other prerogatives of our Blessed Lady, cannot have justice done it by the mere mention of it. We must make it our own by meditation before we can understand all that it involves. But neither the Immaculate Conception nor the Assumption will give us a higher idea of Mary's exaltation than this title of co-redemptress, when we have theologically ascertained its significance. Mary is vast on every side, and, as our knowledge and appreciation of God grow, so also will grow our knowledge and appreciation of her His chosen creature. No one thinks unworthily of Mary, except because he thinks unworthily of God. Devotion to the Attributes of God is the best school in which to learn the theology of Mary; and the reward of our study of Mary lies in a thousand new vistas that are opened to us in the Divine Perfections, into which except from her heights we never could have seen at all. What then is the place which our Lady's Compassion holds in the purposes of God? This grandeur of co-operation in a great measure answers the question. Her dolors were not necessary for the redemption of the world, but in the counsels of God they were inseparable from it. They belong to the integrity of the Divine plan; and they doubtless perform many functions in it which we are unable to apprehend, and which perhaps we do not so much as suspect. According to God's ordinance, without shedding of blood there is no remission for sin. One of our Lord's infantine tears had enough in it of worth, of humiliation, of merit, and of satisfaction, to redeem the sins of all possible worlds. Yet as a matter of fact we were not redeemed by His tears, but only by His Blood. Hence Bethlehem was not necessary for our salvation, nor the worship of the three kings, nor the presentation in the temple, nor the flight into Egypt, nor the disputing with the doctors. Nazareth was not necessary for our salvation, with all the beautiful mysteries of those eighteen years of hidden life. The public ministry, with its three years of miracles, parables, sermons, conversions, and vocations of apostles, was not necessary to our salvation. Indeed, our Lord might have suffered as a Child, or He might have come full-grown like Adam, and simply suffered death at once. His Blood was all that was absolutely necessary. But Bethlehem and Nazareth and Galilee belonged to the integrity of the Divine plan. They were not only congruous, and beautiful, and significant, and full of teaching; but there are deeper mysteries in them, and a diviner reality, simply because God planned it so. All His works partake in their degree of His perfections: in what degree then must the mysteries of the Thirty-Three Years partake of His perfections? The creation of the world was as nothing compared to the spiritual cosmogony of those Thirty-Three Years, except that it was the root of them. No one would dream of thinking lightly of the mysteries of our Blessed Lord's Sacred Infancy because we were not redeemed by them. They are a part of a whole, a Divine whole. We do not know what would have happened, or what we should have lost, and what eternal consequences might have come, if they had not been there. So it is with our Lady's dolors. Her Maternity was indispensable to the Passion. Her dolors do not appear to be so. But they were an inevitable consequence of her Maternity under the circumstances of the Fall. They take their place among the Gospel mysteries. They rank with the mysteries of Bethlehem and Nazareth, not perhaps, in their intrinsic importance, but in the relation in which they stand to the redemption of the world. Indeed, we may be allowed to say that even in their intrinsic importance they might be compared with some of our Lord's Own mysteries. For is it quite clear that His mysteries and hers can be divided off in this way? Are not her mysteries His, and His mysteries hers? Is not the Immaculate Conception a glory of His redeeming grace? Is not her Purification as much His mystery as His Own Presentation? And in the case of the dolors the union of the Mother and Son is greater than any other mystery. He is Himself her one dolor seven times repeated, seven times changed, seven times magnified. In our belief, the dolors of our Blessed Lady rank very high indeed among the Divine mysteries, and have a more privileged precedence there than is commonly suspected. But, at any rate, so far as their relation to the redemption of the world is concerned, they are not further off from it than the unbloody mysteries of Jesus, and perhaps nearer, because of the immediateness of their connection. The truth appears to be, that all the mysteries of Jesus and Mary were in God's design as one mystery. We cannot break it up, and divide and parcel it out, and classify the importance of its various glories. This is a task beyond our science. 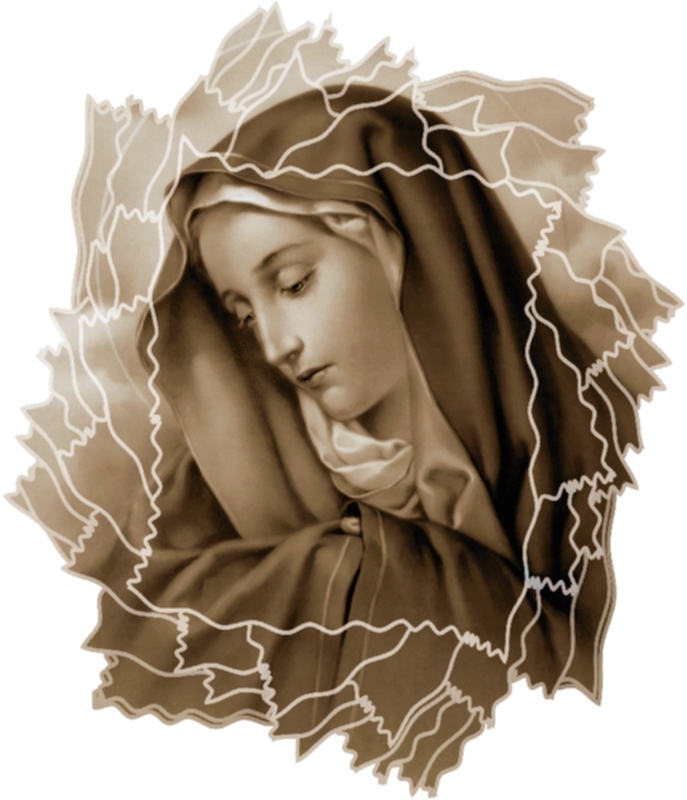 Who can doubt that it is true to say that many, who now are saved, would have been lost except for Mary's dolors,-----while yet her dolors do not bear the same relation to us as the Passion of our Blessed Lord, even in their subordinate degree? The whole of the Three-and-Thirty Years, and the Hearts of Jesus and Mary in all the mysteries of those Years, are tinctured with the Passion; yet outside the Passion itself, where are the colors deeper, and the traits more lifelike, than in the Mother's dolors? Mary's Compassion was the Passion of Jesus as it was felt and realized in His Mother's Heart. Is this then the whole account of the matter, that the Passion it was necessary, and the Compassion unnecessary? Who would venture to say so? Who would dare to say that the Hidden Life of Nazareth was unnecessary? There is surely a very grave sense in which all the component parts of a Divine work are necessary; for God is not such an artificer as man. If we are to rest simply on the doctrine that it was precisely blood-shedding by which our redemption was accomplished, then in the Passion itself, were there not many things which were by no means necessary? There were the mental agonies, the public shame, the varieties of corporal torture, the insults, the lassitude, the thirst, the fear, the dereliction on the Cross. In that sense none of these things were necessary for our redemption. Even in the matter of Blood-shedding one drop would have sufficed: why was it all shed? Why the Sweat, the Scourging, the Crowning, the violent Unvesting, the Piercing after death? The profusion of the infinite was surely unnecessary, in our sense of that word. Now, these are precisely the mysteries among which we ought to rank the dolors of Mary. They belong to the class of what we call the Unnecessary Sufferings of the Passion. Indeed, they were literally our Lord's Own Unnecessary Sufferings; for were not her sorrows by far the most cruel instruments of His Passion? Her co-operation with the Passion by means of her dolors is wanting certainly in that indispensable necessity which characterizes the co-operation of her Maternity. But it far more than compensates for that by the heroic detailed endurance of such griefs, the ever-flowing fountain of free will and promptitude, the unmingled and disinterested suffering, and its immediate contact with the Cross of Christ, which distinguishes it. In her Maternity she had joy as well as sorrow, and an unexampled dignity. Her consent to it was given once for all; and the co-operation of her Motherhood with the Passion was rather material than formal. This second co-operation of her dolors had more of herself in it and more similitude to her Son; it cost her more, and the very absence of necessity for it made the sacrifice the more generous and wonderful. Her Maternity had to do with the Incarnation as the Incarnation: her dolors with the Incarnation as it was redemption also.